Compositech manufactures several filters used in food and beverage processing applications. Our most recently designed vacuum press machines are now in full operation processing sugar for several plants in Louisiana and Texas. Our vacuum presses are able to process twice the amount of cane mud as the drum filters previously used by these sugar plants. In additional to our vacuum press, Compositech manufactures belt press filters used for food processing. Compositech belt presses are built with a cantilever frame which is easy to clean and provides for the use of seamless belts. 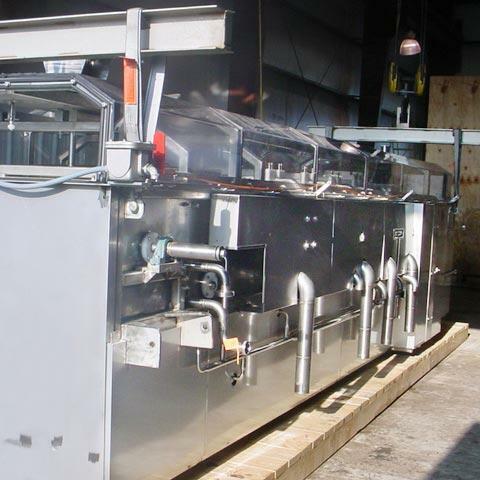 Our belt press filter is well suited to food processing and is currently in use at Pilgrim Pride and at American Rice. We have also been instrumental in replacing parts and completely rebuilding belt presses for several food processing customers. Our rebuilt belt presses include improved designs which increase throughput, increase dry solids content, and reduce operations and maintenance costs. We produce drum filters specifically used to handle slurries with variations in cake thickness, moisture content and stickiness. These conditions are frequently experienced in food and beverage processing. The belt discharge, string discharge, or precoat discharge drum filters most often used in these applications are extremely versatile and provide reliable, continuous liquid and solid separation with minimum operator attention. We manufacture several horizontal belt filter models used by our food processing customers and we have fully enclosed models with food grade components to accommodate cake processing. Horizontal Belt Filters are used in food processing applications where washing of the cake is crucial. The horizontal belt filter is capable of washing soluble components from the filter cake and reducing residual moisture to very low levels in the dry zone. 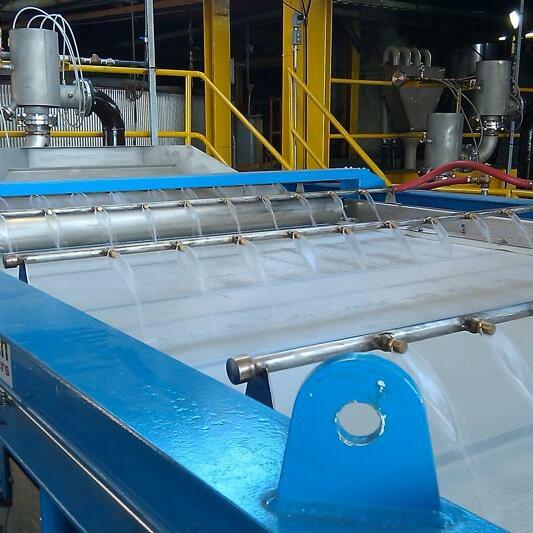 The continual filtration process includes constant filter cloth washing to provide a clean cloth belt for every filter cycle. With this type of system, the entire process can be observed from feed to discharge. Horizontal belt filters require no tank so the inventory of the slurry is reduced to what is actually being filtered. Compositech produces a line of horizontal belt filters designed specifically for food processing. These filters feature tubular frames for ease of cleaning and special food grade materials are used in filter construction and for coatings. We use non-lubricated FDA approved polymer bearings, fully enclosed troughing supports, full coverage drip pans with flanged drains, and fully encapsulated drainage belts. With Compositech's horizontal belt filters, many different slurries can be filtered, including fibrous materials, fine slimes, and coarse granular or crystalline solids. Horizontal belt filters provide high extraction efficiency, low cake moisture, increased production, and reduced operating costs while achieving maximum filtration area in comparison to other filter operations. In addition to manufacturing our own design of vacuum press filters, drum filters, belt press filters, and horizontal belt filters, we also provide replacement parts and filter rebuild services for other filter brands and other types of filters. For food and beverage processing, we have several customers who use vertical press filters in their processes and our spare parts manufacturing capabilities include a variety of parts for these filters. Vertical press filters offer large capacity, improved cake washing, low cake moisture content, and increased process recoveries in operation which makes them ideal for certain applications in food processing. Our goal in manufacturing replacement filter parts is to offer upgrades to filter performance and reliability. Our parts meet vigorous standards for quality and durability and are designed to offer increased filter performance and lower maintenance costs. Compositech is committed to meet or beat the quality of the original equipment used by the filter manufacturer for all replacement parts we manufacture. We manufacture and stock Compositech spare parts for Alar, Ametek, Andritz, Ashbrook, Bethlehem, Carter. Dorr-Oliver®, Eimco®, Envirex, Enviroquip, Hoesch (Pannevis), Komline-Sanderson®, Larox, Parkson, Peterson, SernaTech/Sernagiotto, Westech and various other filter manufacturers. Our replacement parts are manufactured and warranted by Compositech and meet or exceed the quality and material of OEM components.